“It’s probably from Lord Baltimore’s coat-of-arms,” my mom replied. That was enough to satisfy me. It’s still hideous, but I had a plausible answer. I didn’t even notice that my mom was using her tablet until a few minutes later when she said, “The official flag of the state of Maryland consists of the 17th century heraldic banner with the colors and shield from the coat-of-arms of the Calvert-Crossland families of Sir George Calvert, the first Lord Baltimore.” She was reading from Wikipedia. I joked that they had some ugly family colors. Those Marylanders who supported the Confederacy, many of whom fought in the Army of Northern Virginia of General Robert E. Lee, adopted the Crossland banner, which was red and white with the bottony (trefoil) cross (seen as “secession colors”) and often used a metal bottony cross pinned to their gray uniforms or caps (kepis). The black and gold (yellow) colors with the chevron design of the Calvert family were used in the flags and devices and uniform pins of the Union Army regiments in the northern Army of the Potomac. After the war, Marylanders who had fought on either side of the conflict returned to their state in need of reconciliation. The present design, which incorporates both of the coats of arms used by George Calvert, began appearing. I was shocked. 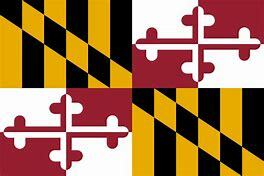 I knew that some Southern states still had issues with their state flags, but I had no idea that a supposedly Northern state like Maryland had Confederate symbology in their flag. Since Wikipedia was our source, I decided to dig a little deeper. I went to the official website of the state of Maryland. They have a whole section on the history of their flag. It turns out that Wikipedia was right. The state’s official history says that the Marylanders who stayed true to the Union wore the black and yellow while the “rebels” wore the white and red. The two symbols came together by 1880, “symbolically representing through this new flag the reunion of all the state’s citizens.” The flag was declared the state flag in 1904. They describe it as, “a flag for unity and reconciliation for all the state’s citizens.” Obviously, when they say citizens, they must mean only the white citizens. This really bugs me. It’s yet another example of how the Union won the war and then lost the peace. It’s something that I have trouble wrapping my head around. As an American, I’m horribly embarrassed by things like slavery and Jim Crow. They were terrible things. All Americans should be ashamed of our country’s misdeeds. There is no healthy way to reconcile the two sides of the Civil War. The South was wrong. They were a very large group of un-American traitors. They were fighting to defend chattel slavery, one of the greatest evils the world has ever seen. There’s no other way to look at it. The South and all of their supporters were wrong. So, change your flag, Maryland. The attempt at reconciliation is misguided. Stop supporting the bad guys.